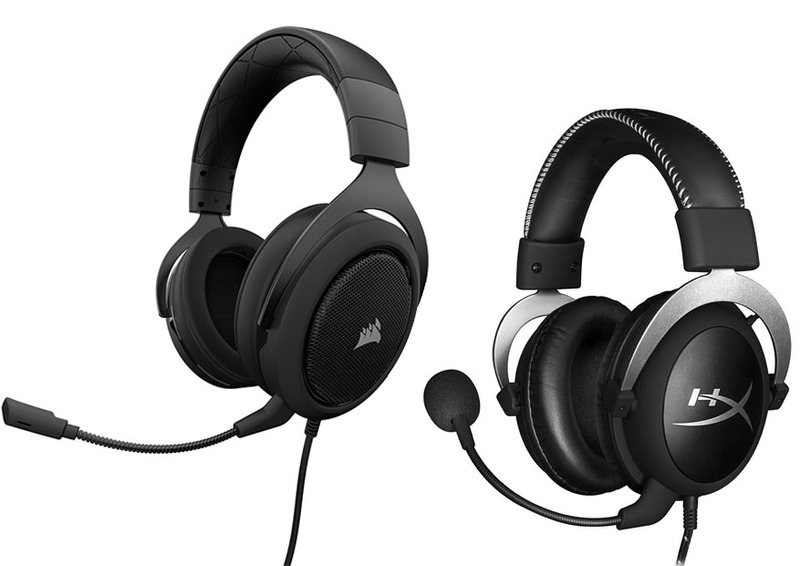 Corsair HS50 and HyperX Cloud are two highly-rated gaming headsets. They are quite affordable, especially if compared to the other big names in the industry. Even so, Corsair HS50 and HyperX Cloud are both known for their superior sound quality. So, which one is better? See the comparisons between Corsair HS50 vs HyperX Cloud below for the answer! Corsair’s products are known for their excellent build quality, and Corsair HS50 is not an exception despite being an affordable model. It has a metal construction for long-term durability. It looks rather simple, without any fancy flashing light. The look is rather stealthy, as it features a jet-black finish. See also: Logitech G633 vs HyperX Cloud 2. The headband is covered in quilted leatherette. It does not feel really luxurious, but it is effective in providing the best comfort to the head. The fit is perfect. It can stay on your head without gripping too tightly or gnashing your ears. The ear cups have wire mesh, but note that this is not an open-back unit. The ear pads and mic are detachable. You can change the ear pads, but you need to buy the spare set separately. On the other hand, HyperX Cloud is available in several color choices, such as white, red, and silver. It also boasts a durable aluminum frame, so it is also really durable. This headset is also comfortable, as the frame can stretch easily to fit just about any head size. The headband and ear cups are padded with leatherette. Similarly, the ear pads and mic are detachable. Leatherette and velour ear pads are sold separately. Corsair HS50 comes with precision-tuned 50 mm Neodymium speaker drivers to give you superior accuracy and sound quality. As usual, in-line controls are available. Corsair HS50 connects to your PC using a 3.5mm connection. It can also be used on PS4 and mobile devices. For use with Xbox One, you may need a 3.5mm adapter. On the other hand, HyperX Cloud is equipped with 53 mm drivers to deliver powerful and lush sounds. Similarly, this headset uses a 3.5 mm connection, and is compatible with PC, PS4, mobile devices, and Xbox One with an adapter. Both Corsair HS50 and HyperX Cloud are Discord-certified. So, they both can allow you to conduct clear communication with your team. HyperX Cloud is also TeamSpeak-certified. Without an external DAC, Corsair HS50 will only give stereo sound. You need an external DAC in order to enjoy virtual surround sound. Even so, the sound quality is truly impressive. It is immersive and warm, with a balanced sound signature. It is not overly bass-heavy, so it can easily deliver excellent audio details. HyperX Cloud is also a stereo headset, but the large drivers can deliver impressive sound signals while maintaining a wide sound stage. Compared to Corsair HS50, the bass of HyperX Cloud is slightly fuller and more powerful. Even so, the mids and highs remain accurate. - Legendary Corsair build quality and metal construction ensures long-term durability. - Precision tuned 50mm Neodymium speaker drivers bring superior sound quality with wide range and accuracy. - Optimized unidirectional Microphone reduces ambient noise for enhanced voice quality and is fully detachable for use on the go. - Microphone is removable and can be found under the box. Both are great gaming headsets. They have many similar features. But, in the end, HyperX Cloud is more recommended. This model has slightly more powerful output and better sound quality. gamepol.com is a participant in the Amazon Services LLC Associates Program, an affiliate advertising program designed to provide a means for sites to earn advertising fees by advertising and linking to gamepol.com (amazon.com, amazonsupply.com, or myhabit.com). Gamepol.com © 2019. All Rights Reserved.